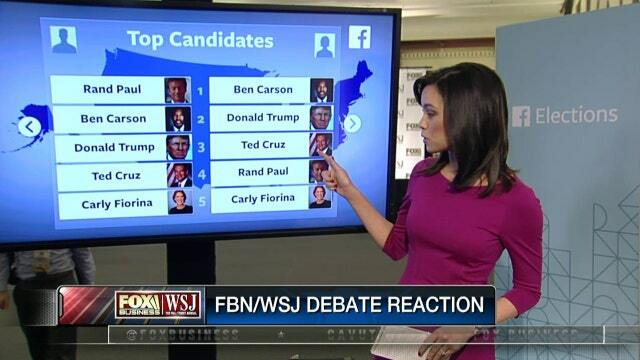 FBN’s Jo Ling Kent on what is trending on Facebook following the FBN/WSJ GOP debate. Social media is becoming an increasingly important factor in determining how the presidential candidates are faring this primary season. Platforms including Facebook (NASDAQ:FB) are abuzz with chatter, especially during debates. From fiery exchanges to poignant responses, the candidates’ performances are dissected on social media. The FOX Business/Wall Street Journal debate Tuesday was no exception. According to Facebook, former Florida Gov. Jeb Bush was the least talked about candidate among both sexes. The most talked about issues on Facebook during the debate were taxes, immigration, minimum wage, jobs and health care. The top moment in the debate on Facebook was a heated exchange between Kentucky Sen. Rand Paul and Florida Sen. Marco Rubio over the tax code.